LED (Light Emitting Diode) Therapy has recently become one of the most popular methods to treat various skin conditions. This led therapy procedure is based on wavelengths of light, which penetrate the skin surface and align its structure. Although LED Therapy has been introduced at the beginning of the 20th century, it is a rather new technique in the sphere of dermatology. Therefore, it is necessary to carefully treat all peculiarities of it in order to not to become the victim of fashion. The mechanism of LED application for dermatology is based on the opportunity of the certain wavelength of light to stimulate the production of adenosine triphosphate (ATP). ATP is the element, responsible for the formation of energy for the cells of the body. From the point of view of our skin, ATP consists of collagen and elastin. These elements help to maintain skin elasticity and firmness. In addition, the increase of collagen and elastin level assists launching the natural recovery mechanism. In other words, they stimulate the renewal of connective tissue and reduce the number of various skin defects. 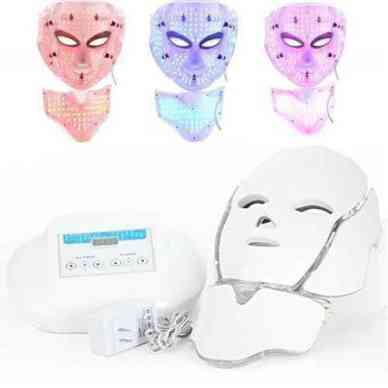 Nevertheless, talking about LED Therapy, it is necessary to understand that it can be performed through the use of different types of light, which has various impact on your skin. Red light is mostly effective for the production of collagen. Therefore, it is appropriate to apply for the reduction of wrinkles, stretch marks, signs of sunburns, etc. Blue light has a rather antibacterial effect. Due to it, blue LED Therapy is applied in case of skin damages, caused by bacteria such as acne, Staphlyococcus aureus, etc. Yellow light has the most universal spectrum of action. In general, it makes a part of anti-aging therapy. Through the improvement of blood circulation, it leads to the reduction of wrinkles, fine lines and other signs of aging. What skin conditions can be improved? Renewal therapy: scar removal, sunburns removal, etc. In addition, LED Therapy is also good for the general skin care. It may help to improve the skin tone, add brightness, reduce the size of skin pores and restore youthful glow. Non-invasive method. In comparison with any beauty injections. LED Therapy does not require to enter any substances in your skin. In such a way, you minimize the risk to be infected through unsterile instruments. In addition, invasive therapy may trigger allergy, create visual assymetry, etc. Mild lightning. In comparison with laser treatment, LED Therapy produces mild lightning, decreasing the risk of burns. In addition, LED Therapy has only a very small chance to provoke skin cancer in contrast to laser therapy. The only possible side-effects from LED Therapy are dryness, swelling and redness. LED Therapy has all chances to occupy one of the leading positions in the sphere of dermatology and cosmetology. Because of its broad spectrum of action as well as almost harmless nature, more and more woman take this procedure in their list of care services. Nevertheless, it is necessary to understand that LED Therapy is not a panacea. Without proper care and healthy lifestyle, it is unlikely to be able to keep your skin healthy and young.